I love everything this man has written, but I haven’t got this one yet so will be adding it to my TBR! I have this to read and can’t wait ! Love Kadare ….have visited Gjirokaster and heard the gurgling water cisterns he describes in Stone City ….amazing writer much overlooked here! I’ve never read him, but I couldn’t resist buying this book the other day. Looking forward to it. Like you I “can’t get enough of ” Kadare – at least when I return to one of his novels. The Three-Arched Bridge is my favorite and I’ve also read The Pyramid. I have Agamemnon’s Daughter on my pile of books to be read. Your commentary has encouraged me to move it closer to the top. The only Kadare I’ve read is The Fall of the Stone City, but I do want to read more by this author. Good to see so many positive comments here. This sounds wonderful and right up my street Stu – plus it’s translated by David Bellos who does the Georges Perec. Off to pop this on my wishlist….! Another admirer here. I would be happy to see Kadare honoured by the Nobel. 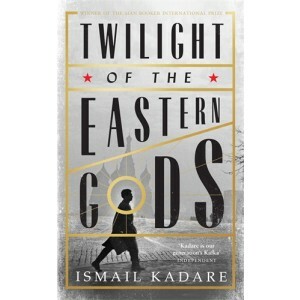 Ismail Kadare is excellent as you say. I read ‘The Successor’ last year, and it was superb. I really like Kadare. So far I’ve read Broken April, The Accident, and The Fall of the Stone City. I’d like to read some of his short stories. As you often do, you’ve broadened my reading horizon. I’d never heard of Kadare but bought this yesterday (sometimes I think I must live in a sterilised London bubble for I’ve never heard of 90% of the authors you read!) Still am glad you bust my bubble frequently and looking forward to this one. I gotta read this! I enjoy Kadare and after reading The Zhivago Affair this would be the perfect follow-up read. I don’t know this Kadare, so thanks Stu. The title’s interesting, the French seems to be Twilight of the Gods of the Steppes, which is similar to the English title but carries different connotations – particularly in the context of one of those countries the Mongols might actually have reached. Great author. I have read nearly all his work. I had to reblog this.